Left photo: Mostly early plaques, which are smaller in size, and are listed by pottery on the 'early plaques' pages, and by transfer on the 'religious' pages. 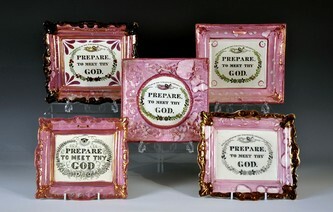 The three slightly larger plaques (the first and second in the front row, and the centre plaque in the second row) date from c1845. Right photo: By 1850, the fashion was for bigger rectangular plaques. 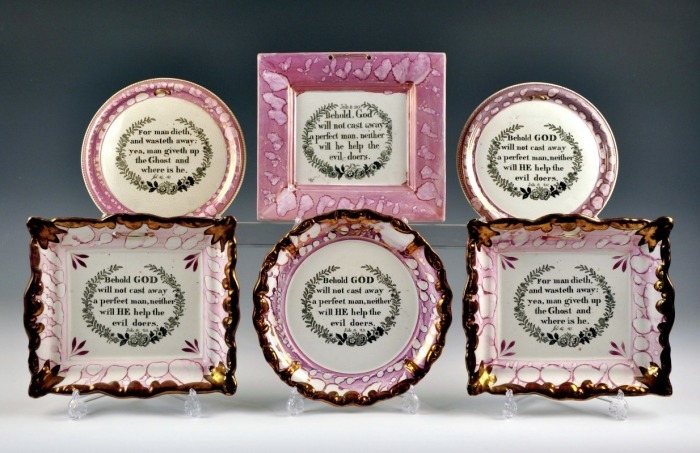 These plaques, which make up the bulk of the 'religious' pages, were produced in much larger quantities, and there are many subtle variations of the verse transfers. 'PREPARE TO MEET THY GOD' is the most common verse found on plaques. The top left rectangular plaque gives the source, 'Amos IV..12'. Others show a trumpeting angel surmounted by the verse 'In thee O Lord do I put my trust; let me never be Confounded; PSA: XXXI. Vir. 1.'. The circular plaque on the left of the middle row has the impressed mark 'C. C&Co' for Cornfoot, Colville & Co, North Shields. Two plaques have an 'all-seeing eye'. Five larger plaques, all unmarked. 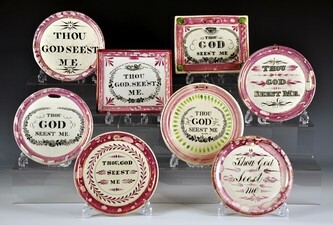 The top right and the centre plaque, have unusual borders, and are attributed to Scott's Southwick Pottery. 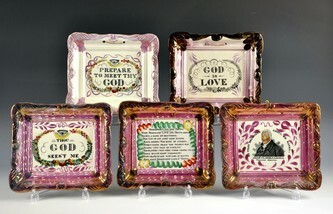 The top left plaque is attributed to Moore's Wear Pottery. Scott's and Moore's sometimes shared transfers. However, although the top left and top right transfers look very similar, they come from different copper plates. 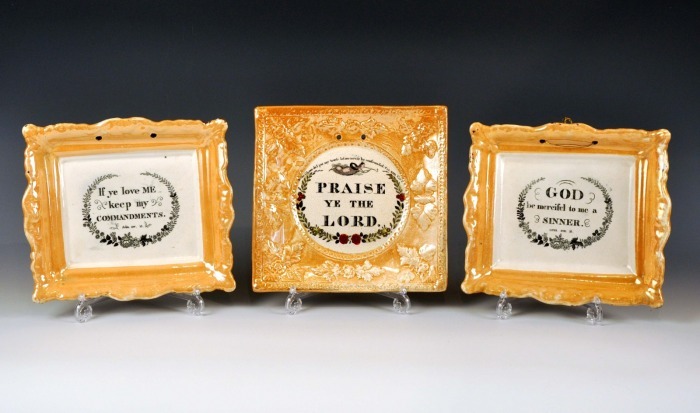 The top three plaques likely date from the 1860s. 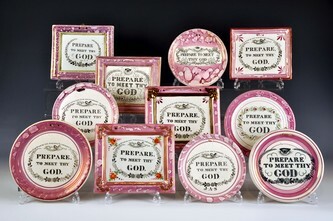 As with the 'Prepare' plaques, the earlier 'Thou god' plaques tend to be smaller in size (see below left photo). 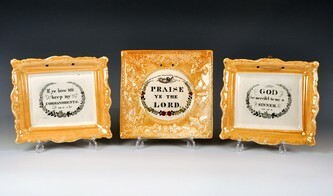 These are listed by pottery on the 'early plaques' pages. 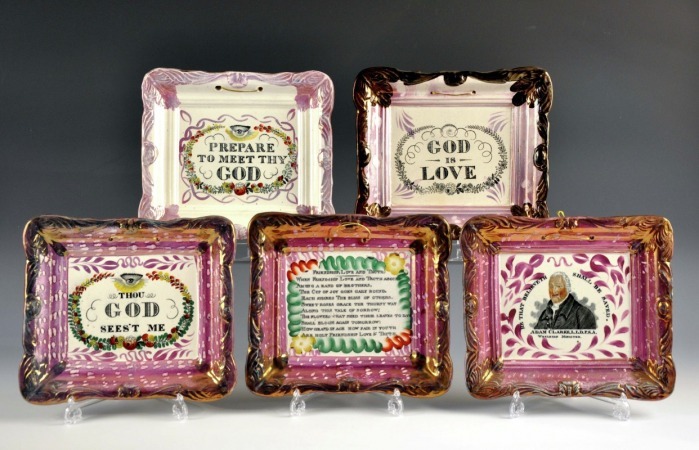 The larger rectangular plaques from the 1850s and 60s (see below right) make up the bulk of the 'religious' pages. 'THOU GOD SEE'ST ME' is the second most common inscription. The two circular plaques on the left have the impressed mark 'C. C&Co.'. 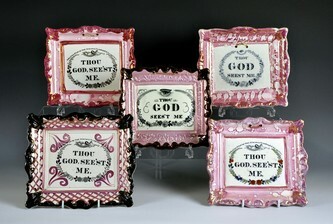 Three of the plaques have hand painted text. One has green flecked brushstrokes and is attributed to Maling. 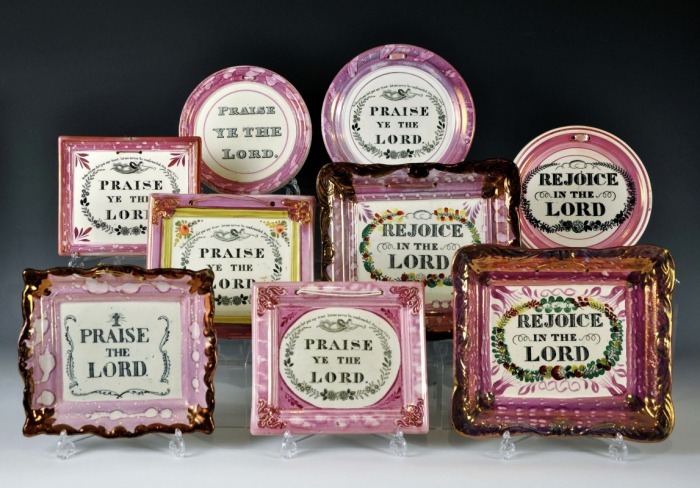 The two hand-painted plaques on the bottom row are attributed to Dixon, Phillips and Co. The top left has the impressed mark, 'MOORE & Co'. The two larger plaques at the bottom are also attributed to Moore's. The top right has the impressed crown mark used by Thomas Fell. That transfer is also found on green-cornered plaques. The centre plaque is attributed to John Carr's Low Lights Pottery, North Shields (see below). 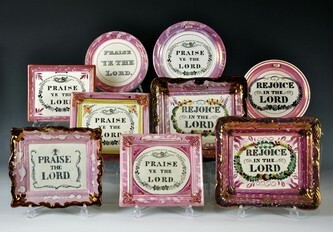 Plaques with the inscriptions: 'PRAISE YE THE LORD', 'PRAISE THE LORD' and 'REJOICE IN THE LORD'. None of the plaques is marked. The two large 'Rejoice...' plaques are of a form attributed to John Carr (see below). The unusual plaque, top centre, is from an unidentified pottery (possibly Carr). It has the bible reference at the top of the text. The others are all from the Garrison pottery. The bottom three are impressed 'Dixon Co'. These plaques are also found with the earlier 'Dixon, Phillips & Co' anchor mark. The verses given below. 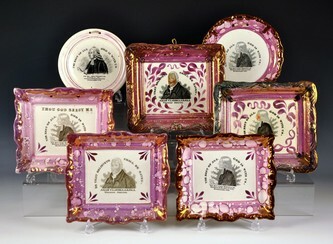 Plaques with John Wesley and Adam Clarke. The small circular plaque is attributed to Maling. 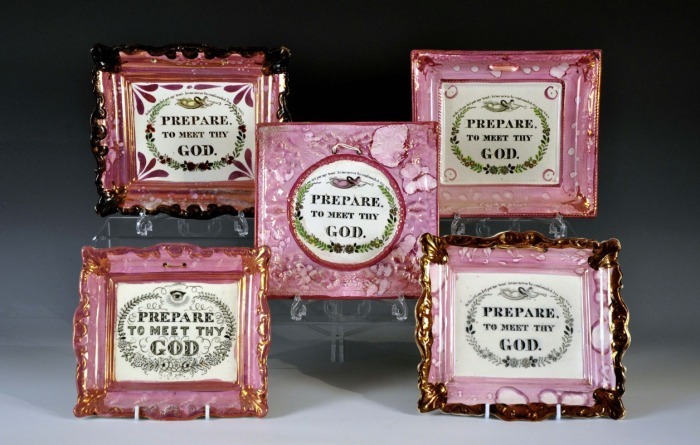 The larger two rectangular plaques are attributed to John Carr, and profusely decorated. The two left rectangular plaques, and the top right circular, are marked 'Dixon Co'. The bottom right plaque has the 'Dixon, Phillips & Co' anchor mark. 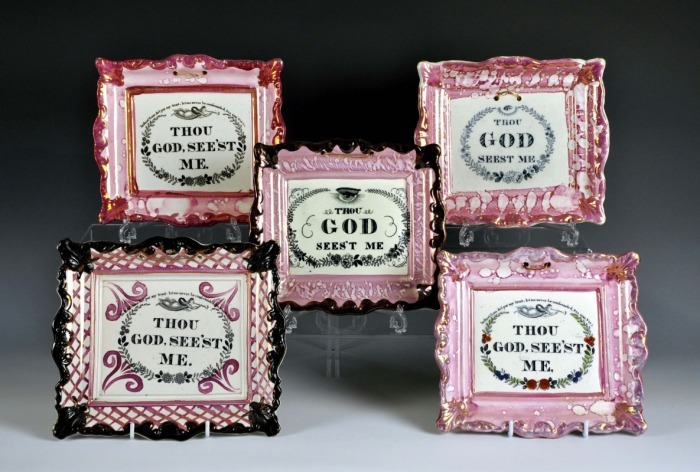 There are Garrison versions of both Wesley and Clarke (round and rectangular) with the banner 'THOU GOD SEEST ME'. Five plaques attributed to John Carr's Low Lights Pottery, North Shields. 'God is Love' and 'Rejoice in the Lord' are verses associated with Tyneside potteries. The bottom centre has the poem 'Friendship, Love and Truth' which is transcribed on the Poetic verses page. The transfer, like the Wesley and Clarke used by Carr, originated at the Garrison Pottery. Carr's apparently purchased the copper plates in 1865 when the Garrison Pottery closed. Baker attributes similar orange plaque to those on the right and left to Ball's Deptford Pottery, c1870. The centre, square, plaque is attributed to Scott of Southwick. Orange lustre was used between the period 1860–1890, and the quality is often poor, with rubbed lustre. Rubbing, poor potting, and a later production date, make orange plaques less attractive to collectors.